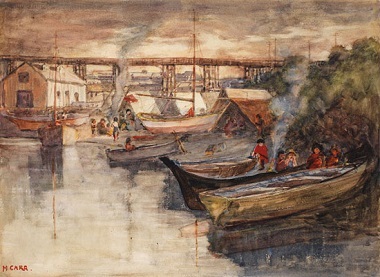 Indian Encampment, Vancouver (watercolour on paper, circa 1908 ~ 1909) by Emily Carr will be auctioned next month. Snauq was the name of the Squamish village at Kits Point, before the Kitsilano Indian Reserve was created in 1876. By 1913 the Native population had been pressured to move from the area. That history has been largely overlooked – I certainly never heard it, growing up in Point Grey –but we get can get a glimpse of it through ‘Indian Encampment,’ a watercolour by Emily Carr from 1908 or 1909. That painting will be auctioned next month in Toronto, but before that it will be on display at the Heffel Gallery on Granville Street later this week (October 28 – 31). Emily Carr painted this delicately observed, atmospheric scene on the shores of False Creek during her Vancouver period of 1906 to 1910. She shows us several families, probably Coast Salish, who have beached their canoes and rowboats and set up tarpaulin tents to cook their meal between a railway embankment and some industrial storage sheds. 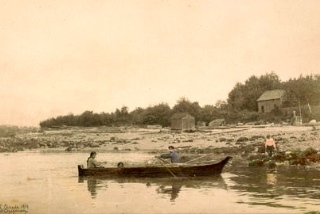 They may have been camped here in order to use their traditional fishing grounds – the sandbank that was later filled in to become Granville Island was still a location where the Squamish and the Musqueam set their fish traps – or to earn cash by selling fish and game to Vancouver’s settler population, or to find work in the local sawmills. Behind them is the CPR rail bridge, the famous ‘Kits trestle,’ which spanned False Creek between Granville Street and the Kitsilano Indian Reserve, carrying trains south to Steveston and Lulu Island. Beyond the bridge is a jumble of roofs – warehouses, lumber companies and factories. “Snauq was the basis for a 37 acre reserve requested in February 1868 by the 42 persons living there under the leadership of Chief Chip-kay-um and established the next year,” wrote historian Jean Barman in a paper called Erasing Indigenous Identity in Vancouver that was published in B.C. Studies in autumn, 2007. [The reserve was] stolen from the Squamish Nation in a series of slippery deals involving the provincial government and the Canadian Pacific Railway. Ten acres of the reserve – land adjoining the south end of Burrard Bridge – was returned to the Squamish in 2002 along with a compensation package. I have written about Emily Carr and her Christian faith here. John Voth and Kenton Klassen in The Lonesome West. Photo by Matt Reznek. The reviews are in, and The Lonesome West is a winner. 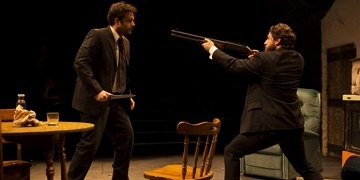 Written by Martin McDonagh, the play is a Pacific Theatre presentation of a Cave Canem production. Brothers Coleman and Valene can’t seem to co-exist without sudden outbreaks of violence over the pettiest concerns. When their doubt-ridden parish priest attempts to bring reconciliation, their confessions quickly turn from earnest offerings into weapons in a hilarious and dark race to the bottom. Pacific Theatre often punches above its weight, and The Lonesome West is no exception. You wouldn’t expect patricide and Catholicism to be this much fun. The Lonesome West runs until November 11. After graduating from Simon Fraser University with a degree in communication, Alicia moved to Rome, where she got an unexpected start covering religion. Stints in Toronto, Madrid and Toronto followed, culminating with her return home to the West Coast. 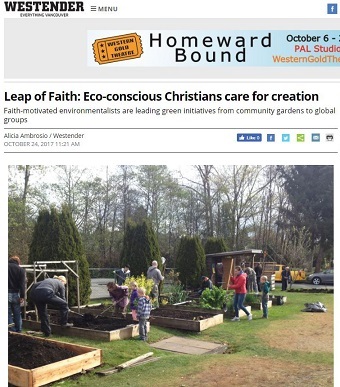 Alicia has worked as a television producer and host, and is currently a freelance writer for Aleteia and Catholic News Service, as well as Leap of Faith, the Westender’s blog on faith and spirituality in Vancouver. Would you believe me if I said the Garden of Eden is for real and it is located in Vancouver? OK, you caught me. But the Garden of Eatin’ is real – and it is a feature on the Victoria Drive property of the First Christian Reformed Church of Vancouver. Part of the garden is made up of plots used by neighbourhood residents and part of the garden is used by the church to grow food for its weekly community dinners, which are open to everyone in the neighbourhood. Volunteers from the church tend that part of the garden and prepare the weekly meal. The Garden of Eatin’ is one of a handful of community gardens in the city hosted by churches. On West 10th and Ontario, Tenth Church is home to The Healing Garden. All the food grown in the garden is organic and is used to supply Oasis Cafe, the church-run cafe that provides cheap meals to locals twice a week, and skills training to people who face barriers to employment. Ambrosio also interviewed Leah Kostamo of A Rocha Canada. In previous weeks she has written on yoga chaplain Bethel Lee, Taizé prayer, why Catholic monks are allowed to brew beer and the St. Paul’s (West End) labyrinth. Fascinating and truthful history of a beloved Kitsilano district. Never fully realized the storied and shameful legacy to this legendary district. Who would have believed Emily Carr’s pictures would provide such a rich and compelling vignette to a little known era of BC and Canadian history? Such revelation leads to a celebration of victimhood by some in the native community, which has led to a litany of federal and provincial apologies and resurrection of old land claims. It is not the history which is at fault. I have reviewed the treatment of the Japanese and Chinese during and subsequent to this period and would respectfully make the case they were oppressed in a more pernicious and oppressive way in that they were not compensated for their land, treated as subhuman, and sent to internment camps wait out the outcome of war. David Suzuki speaks accurately and passionately on his family’s experience. One has to ask, when does this cycle of victimhood end and forgiveness begin? No one people group has an exclusive franchise on oppression and governments continue to do evil things in the name of the “greater good.” In the Biblical model of peacemaking the slippery slope to corruption is fueled by sin and redeemed only by forgiveness. Moreover, the institutions of justice and government are collective and virtual facades for the sins of individual leaders, the political correctness of academics and new political leaders to find fault in historical reconstruction of great Christian leaders such as BC judge Mathew Begbie. I get queasy whenever someone occupying a relative position of privilege and power asymmetrically and undialectically calls on persons dispossessed and outrageously wronged to “forgive” – really meaning: to forget and move on and just let the status quo coast into the future. A status quo which includes the massive off-reservation reservation called the Downtown Eastside. This in particular is taking place today on stolen native land. In my imagination, I try to see Ahab and Jezebel approaching Naboth. The cycling only ends in the willing self-sacrifice by the truly powerful. Prime example: Jesus Christ.